Sheep and the Shire | So Many Exciting and Beautiful Places! Today was a busy day. We started with a visit to the New Zealand Maori Arts & Crafts Institute in Rotarua, which is located in a hot springs park. We were able to view an erupting geyser. 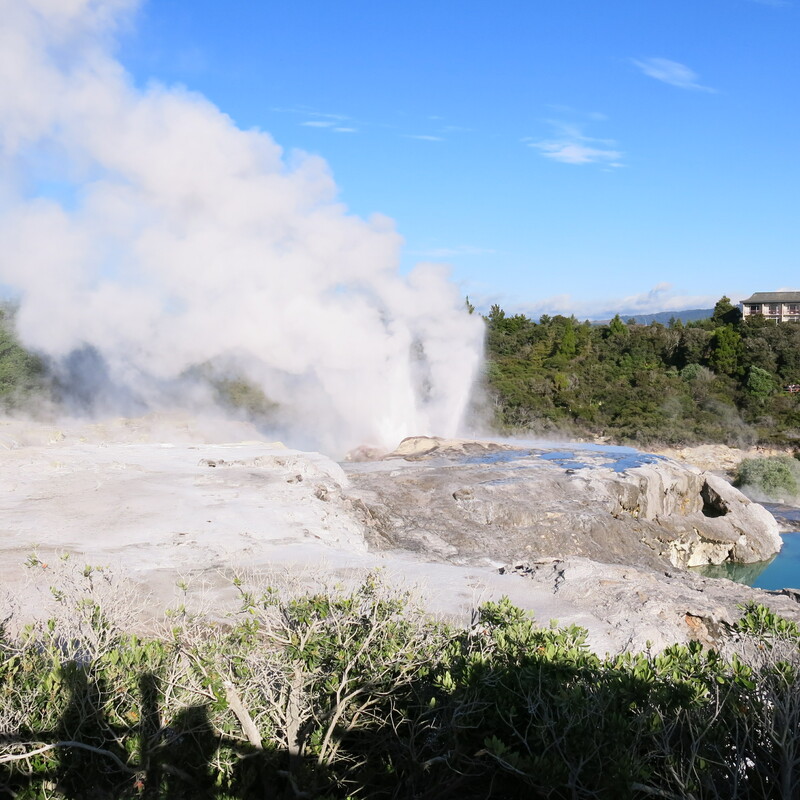 It’s a very active geyser, erupting about once an hour, with each eruption lasting about twenty minutes. 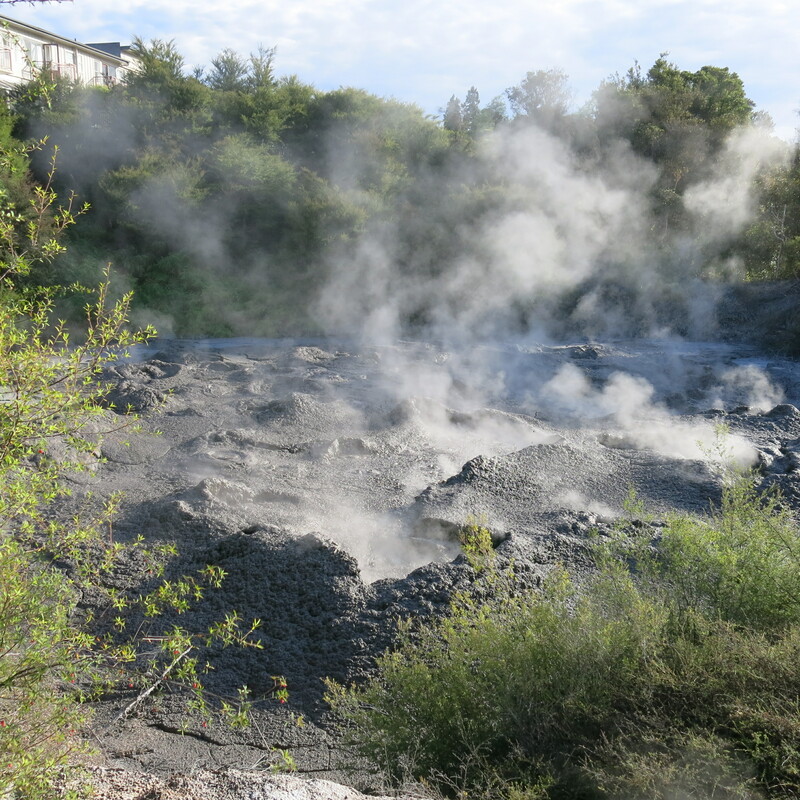 There are also some bubbling hot mud pools. This water and mud are too hot for people to go in, but there is a large spa nearby where you can use the public baths or rent your own private bath. The downside is that there is a pervasive sulfur odor to the town. Every now and then, I’d get a whiff and then try to blame Mark for it. We also viewed some typical Maori buildings and watched a demonstration on creating fibers from a palm frond. The Maoris would scrape the green off using a shell, leaving stringy fibers which they could then spin by hand into a cord or rope. These cords were used in making skirts for some of their ceremonies and dances. 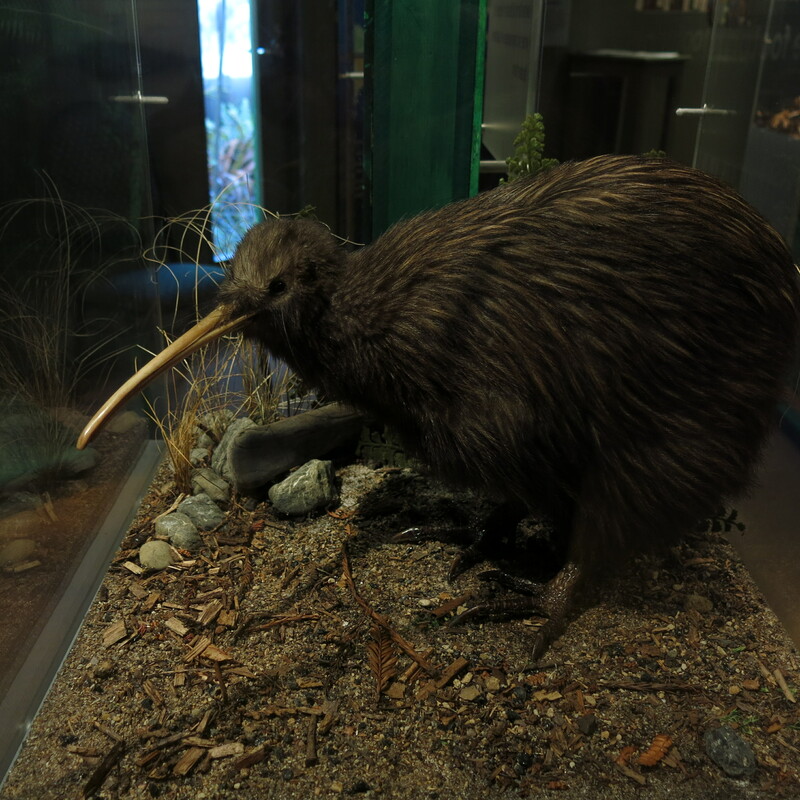 Next stop was at the Rainbow Springs Park and Zoo, where we were able to observe some kiwi birds in their environment. Kiwis are nocturnal, and sleep 18-20 hours per day. (Sounds like a teenager.) 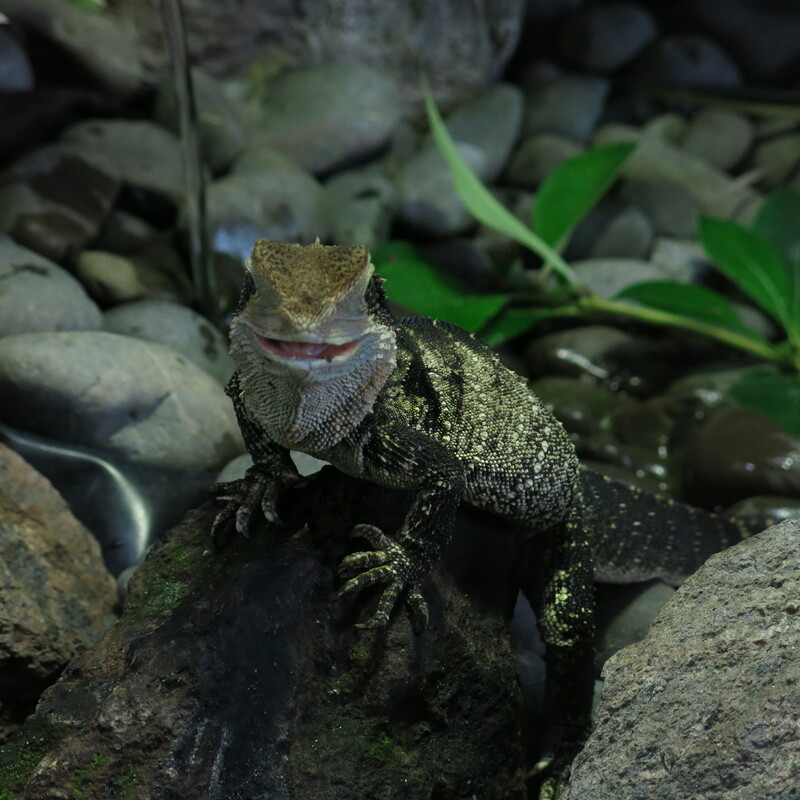 We saw several other native animals as well: birds, lizards, primarily. Then, we went to Agrodome for their farm show. This was a lot of fun. 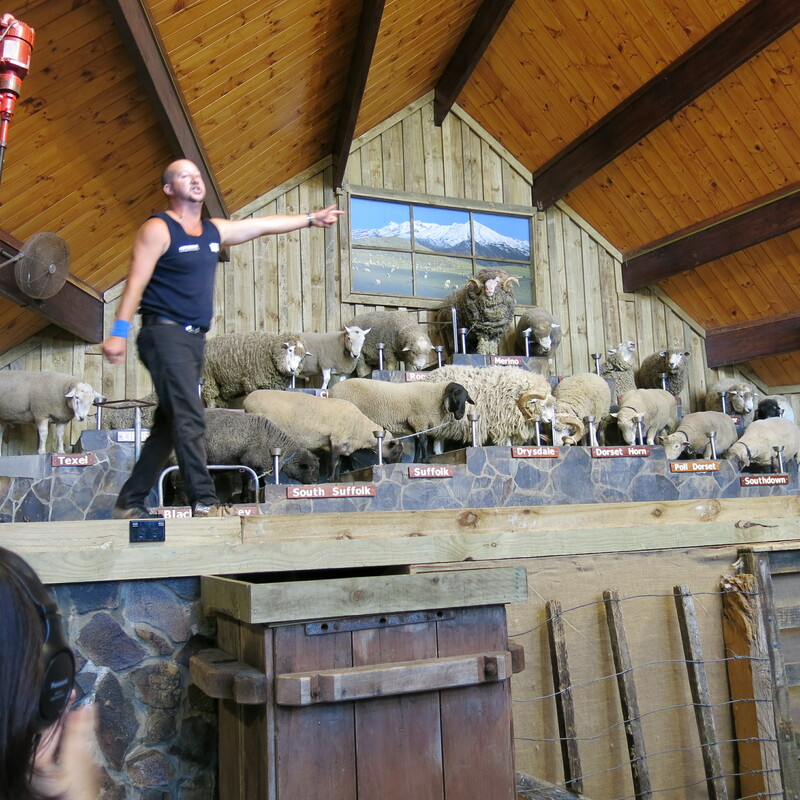 First they trotted out the nineteen breeds of sheep grown in New Zealand, and gave a bit of information about each one. 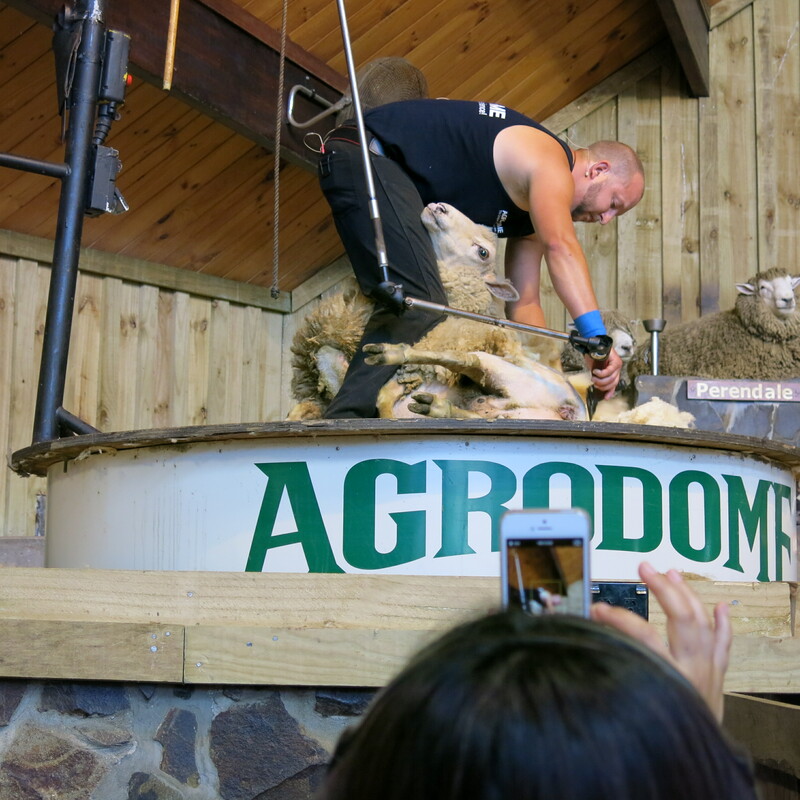 Then, we watched a sheep shearing demonstration, which was educational. The sheep will be very skittish and balky when they bring it in. To calm it, the sheep shearer puts the sheep on its back. The transformation was unbelievable. When shearing the sheep, the shearer always manages to keep it supine and calm. Once it’s done and the sheep is returned to an upright position, it just wants to get away. If the weather is cold, the sheep will grow a thicker layer of skin to protect it until its fleece grows back. The sheep is sheared about every six months. Some of the sheep dogs were brought out. There are several breeds. A desirable one is a cross between a border collie and a doberman. We watched how the dogs herd the sheep (ducks were substituted for sheep,) and the dogs did a show themselves, running over the tops of the sheep that were lined up. The sheep didn’t react at all. 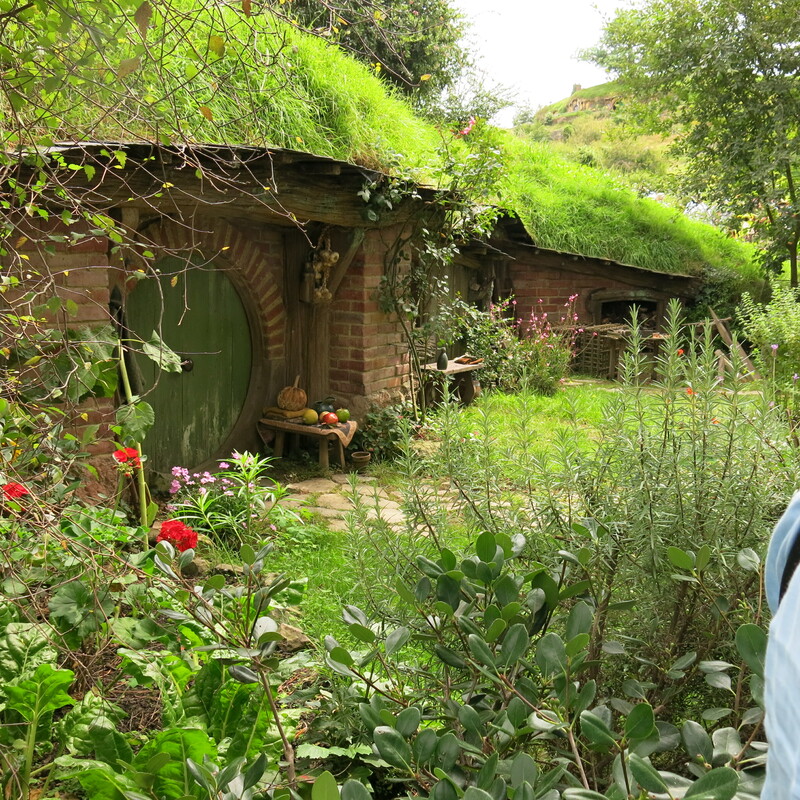 In the afternoon, we paid a visit to Hobbiton – the movie set, that is. The set has been completely rebuilt, and is situated on a large sheep farm. The Kaimai Ranges provide a beautiful background. 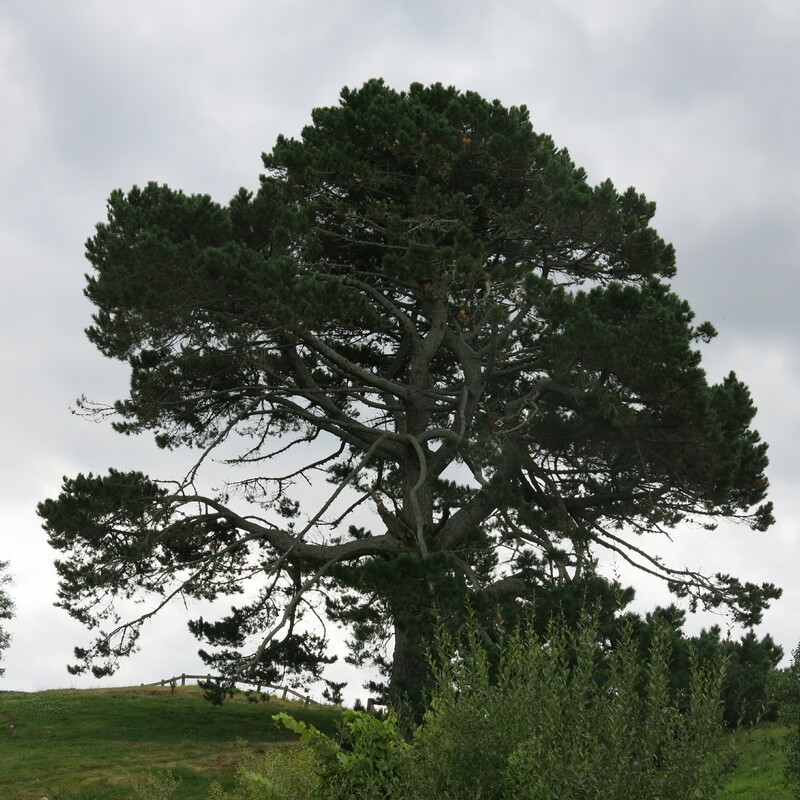 One of the things that attracted Peter Jackson to this locale was the gnarly trees that were growing there. Their limbs grow up, out and down. Unfortunately, some of the foliage wasn’t the right size, so he had the leaves cut back, and artificial, larger, leaves attached. 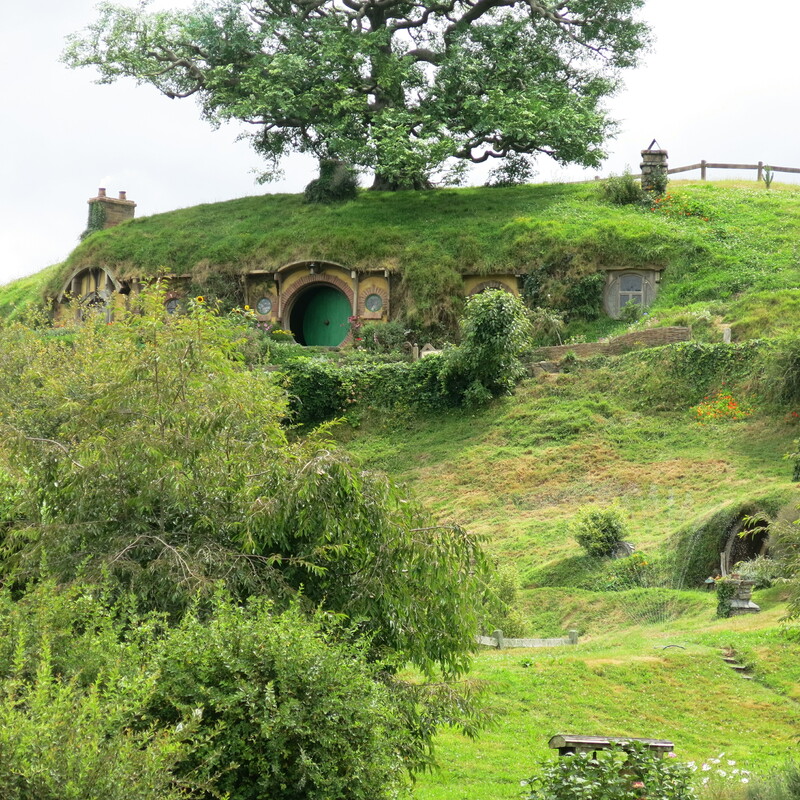 The tree above Bilbo Baggins’ house was completely artificial. It is made of cement, was made in pieces, then assembled on site. 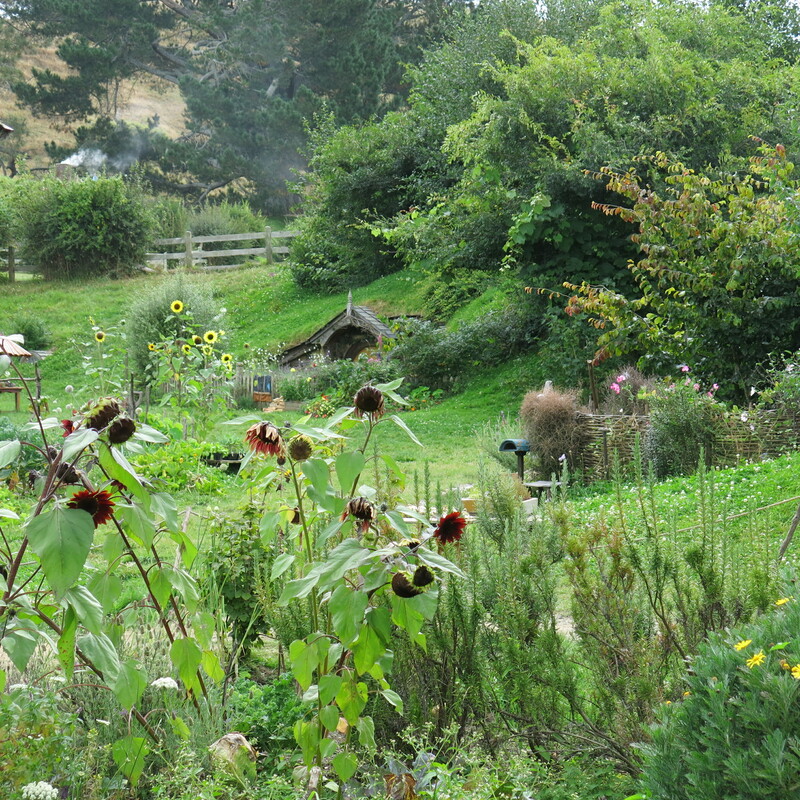 The land is rolling with several ponds, many trees and shrubs, making it a perfect site. 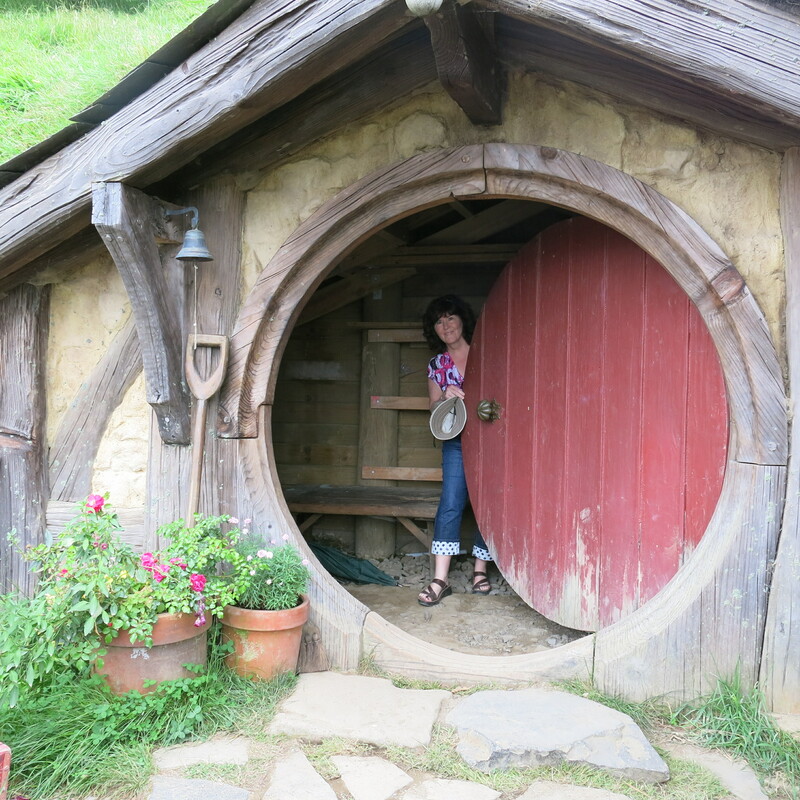 There are several different sizes of hobbit hole: small ones to make Gandalf look large, and large ones to make the hobbits look small. 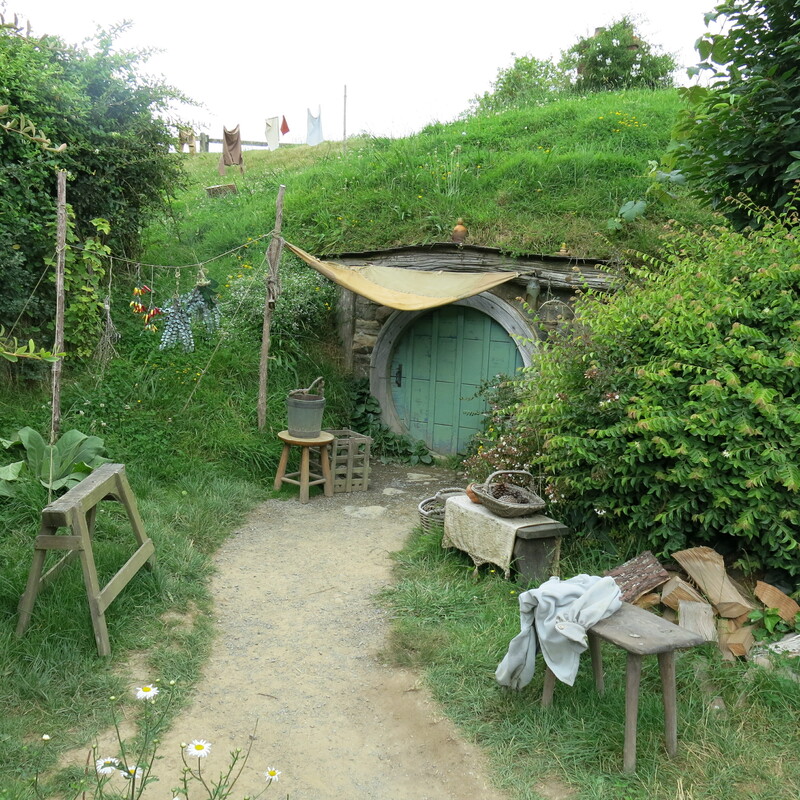 The set was used in filming the Hobbit movies as well as the Lord of the Rings trilogy. At the end of the tour, we stopped at the Green Dragon Inn for libations – beer for Mark, ginger beer for me. 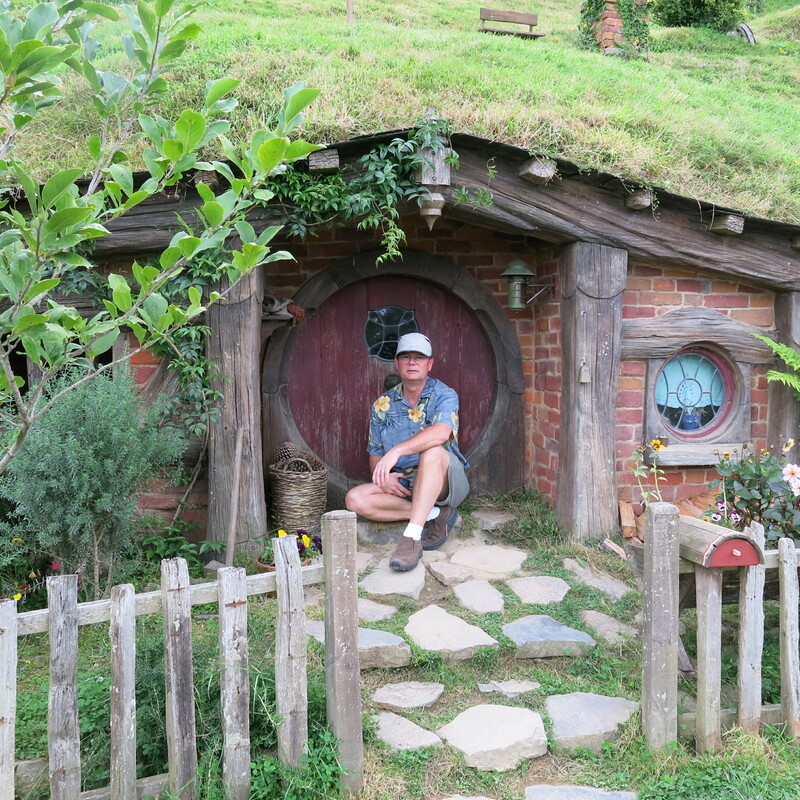 This entry was posted in New Zealand Travel and tagged Hobbit, New Zealand. Bookmark the permalink.